Experience the Difference....We're All About Your Pets! My husband and I have been taking our pets Toby, Gunner & Nitro to Dr. Ingold since 2008. Dr. Ingold and his staff have been nothing but thorough, kind, caring and outstanding with all service and procedures! April first started going to see Dr. Ingold at 2 years old, she is now 8 ½ yrs. old. During this time, April has had many issues with her health, from Heartworm, to a bulging disc in her back. Dr. Ingold has attended to her needs in an extremely professional manner. He is always ready to spend time with us to answer our questions and explain to us so we fully understand how we need to care for her and her recovery. We always find that there is not a rush during our appointment with him. We have always found his staff to be knowledgeable and compassionate towards our beloved pet. My husband and I have total trust in his expertise with our pet. I would completely recommend Ingold Veterinary to friends which we have done on many occasions. Thank you, Dr., Ingold for all you do for April to maintain her health needs. We appreciate you so very much. My new kitten Cooper recently became a patient of Dr. Ingold. I haven’t had any pets for a few years and my former vet was not taking new patients. I remember Dr. Ingold had worked with my previous vet and was glad to hear that he was taking new patients. I have found Dr. Ingold and staff are very knowledgeable and friendly. The office is modern and clean; I would recommend him highly. I wish Dr. Ingold could be my doctor! He has been there for our pets for 8 years and I wouldn’t change vets for the world. When my cats were ready to leave this world, he was with me every step of the way explaining everything and letting me make the final decision. In my mind doc John rocks. Takes the extra time to provide a personal touch in caring for our pet. We’ve enjoyed our experience since we moved to the area in 2009 and went to see Dr. Ingold at the recommendation of the physician recruiter at York Hospital, we haven’t been disappointed. We appreciate Dr. Ingold’s frank and pragmatic approach. He has taken wonderful care if our now senior dog Nena. Thanks for your help and dedication! We enjoy bringing Zoe for her visits. Dr. Ingold is very caring and has a general concern for her. Zoe seems to cooperate with the staff. In our family, we had 4 cats while our 2 girls went thru grades K-12 and beyond. It was always a family event to visit Dr. Ingold and talk about cats and school. They learned a lot from the visits and both are now pursing medical related careers! Thank for being family friendly. Our two dogs and cat are like family to us. Which is why we are blessed to have found Ingold Veterinary Hospital. Their staff is always friendly and courteous and know us and our pets by name. We are thankful for the expert care Dr. Ingold and his team provide to our pets. From routine exams to surgical procedures and diagnosing specialized needs, Dr. Ingold and the staff of Ingold veterinary Hospital provide compassionate care that always has the best interest of our pet in mind. When we talk with other pet owners looking for veterinary care for their four-legged friend, we heartily recommend Ingold Veterinary Hospital to them. Thank you for going above and beyond to keep our pets happy and healthy. Boaz is not an easy patient, as he is frequently scared of everything unfamiliar. Yet, you are able to handle him and to keep everyone, including Boaz safe during his “unpopular” nail trims. It is the only time that I see him do the mini-panther thing. Thank goodness Dr. Ingold has the hand hold that works! Echo has been having some UTI issues lately and Dr. Ingold has come into office on a Saturday to help make her feel better. Hopefully this issue is resolved, she is doing much better. There is so much pain in losing a loved one. But nobody understood that more than you. Our kitty-cat, Clive, was so special to our family. You immediately recognized that, even before we detected the bladder/kidney problems; at the regular check-ups you were kind and friendly to him even as you got all the work done. And then when he did get sick, you did absolutely everything possible to save him. Even when we had difficult decisions to make, you were there for us and helped guide us on a path that was best for our family, INCLUDING Clive. We're so thankful that you put up with us, our frequent calls during Clive's last days, and always treated us with the same dignity and respect that you gave to Clive. We still miss him, but we're confident that we did the best we could for him by taking him to you. You guys are the best in town and we encourage every animal lover to take their pets to you for regular check-ups to make sure they stay healthy and live as long as they can!! Thank you so much for your warmth and your kindness, and for all you have done for our Misty. We'll never forget her. She'll always be in our hearts. And especially to you Dr. Ingold, for all you have done, not only for our Little Misty, but for us also. Just a quick thank you for taking such great care of Dude. He is doing very well and healing nicely. We appreciate the care you give to both of our dogs, Dude and Beacon. Thank you again! Just wanted to say thanks for taking care of Murphy over the past 6 years. We had a great comfort in bringing him to see you for his more recent procedure. He's doing great! We began bringing our pet, Auggie Doggie (does that date us?) to Dr. Ingold's office by referral. Auggie is our 4 ½ year old Yorkshire terrier who was supposed to be a teacup, but he turned into a coffee mug! Besides being overweight and needing to lose one-third of his total body weight to relieve the strain from his major organs, Auggie has other health concerns which Dr. Ingold helps us manage. Auggie's bad knee joint, the result of a puppy hood fall, was being complicated by his extra weight. He also has a thyroid disease that we regularly treat with medication to help maintain his metabolism, and as if that wasn't enough, Auggie-Doggie also has skin allergies which drive him crazy! But Dr. Ingold recommended we deal with one problem at a time and addressed his weight issue first. 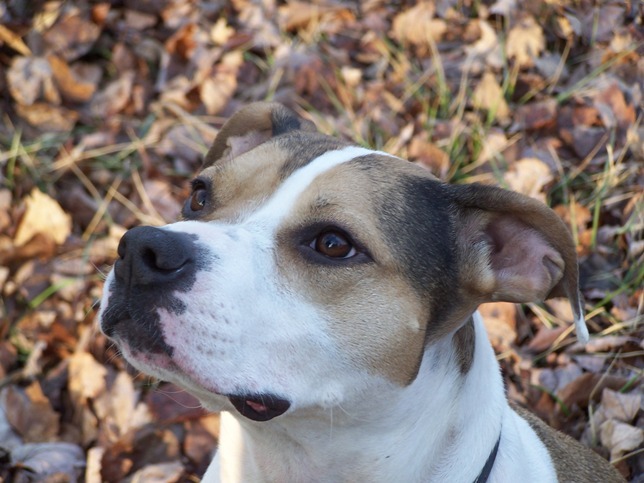 Auggie was placed on Hill's Prescription R/D weight management program designed just for him. Dr. Ingold calculated his goal weight and gave us a precise feeding schedule including the exact amounts to feed Auggie Doggie. Every week (yes, we brought him in for weigh-ins) Auggie Doggie lost weight. He has almost reached his goal weight because ONE-THIRD OF HIS WEIGHT IS NOW GONE! No one recognizes Auggie, and he looks and acts like a young puppy. Welcome back, Auggie Doggie! We believe Dr. Ingold's program added years to Auggie Doggie's life AND life to his years. We are very grateful and appreciate Dr Ingold, and his welcoming staff members. Thanks to all of you for your love and assistance. P.S. Dr. Ingold knew that we were the problem and trained US! Thank you. We came to know the Russo family when they moved to York in 2009. 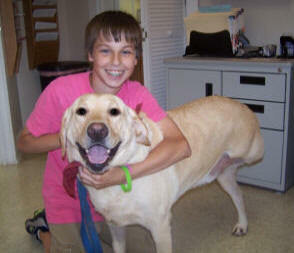 Their beloved Lab, Sadie, was undergoing chemotherapy treatments for Lymphoma. Sadie fought bravely, but she eventually succumbed to the cancer. Tragically, only one week later, their second Lab, Shadow, was diagnosed with Osteosarcoma in the form of an extremely painful malignant tumor present on his left ankle. Still grieving the loss of their other pet and struggling with the financial consequences of treating both dogs, the Russo family was faced with a sobering decision. The Russo’s opted for amputation as the most optimistic treatment plan for Shadow, and so in January of 2010, Dr. Ingold amputated Shadow’s left leg at mid femur. Shadow’s recovery was amazing! Not only did he heal well after the surgery, but he also fought through sixteen weeks of chemotherapy and is now cancer free! His family is overjoyed to have him at home with them where he belongs. The courage and commitment displayed by The Russo’s in their care for both Shadow and Sadie is an inspiration to all pet owners. Proceeding with cancer treatments for both of their pets in spite of the financial and emotional stress is a true testament to all who believe as the Russo’s do, that their pets “are not just dogs, they are part of our family”. According to Mrs. Russo, "We could not be more pleased and happy with Dr. Ingold and his staff. We are always greeted with a smile or kindness when we call. Shadow still loves going to see Dr. Ingold and his staff. He always has a very pleasant visit and is treated with the utmost care and attention. When I would pick him up from his chemotherapy treatments, the girls always had him up behind the (front desk) counter or he was upstairs visiting. I truly believe Shadow’s experience with cancer, his recovery, and his follow up care, showing no cancer in his lungs, has definitely been due to the wonderful care he has received through Dr. Ingold and his fabulous staff." I want to let you know how very much your kindness and compassion are appreciated throughout these past few months of caring for Sadie. Your honesty and integrity as a professional and animal lover have guided me in providing the best care for Sadie through some exceedingly difficult times. Your patience with me has helped me be at ease with decisions that needed to be made and your generosity of time and attention have given me peace of mind as well. And I can't even express in words how very much it meant to your family for you to come to our home so Sadie's final moments could be in the place she felt most comfortable and loved. A special thank you to Jennifer for handling my constant phone calls with professionalism and care. And a special thank you to Betsy, with whom I could tell, Sadie felt a bond. (Her) love for God's creatures shines through. Thank you so much for taking care of Yoghee all the times he had skin infections. We especially want to thank you for helping us when our house burned (July '08)Jennifer was instrumental in helping us, and we are very grateful. Jeff and I wish to express our heartfelt thanks to all of you for taking such wonderful care of our Calvin in his last days. If it had not been for all your care and support through this most trying time, we don't know how we would have had the courage to face the end result. Hopefully, Hobbes will be with us all for years to come, and we look forward to you all taking the same wonderful care of him. Thank you for nursing Oakley back to health. He is a wonderful addition in our lives. We’d like you to have this donation to help absorb costs for future “orphans” like Oakley. Brad and I would like to thank you for all that you did for Jazz in his final weeks of life. You were willing to come in at all crazy hours to try to help him. You and your staff were great, and we want you to know how much we appreciated that. Thanks for all your compassion for Jazz. Stella says..."Please consider adopting your next pet by calling your local SPCA or shelter, a breed rescue or take a look on Petfinder,com. These wonderful pets need your help now!"